Bzzagent has released a ton of new campaigns over the past few days! 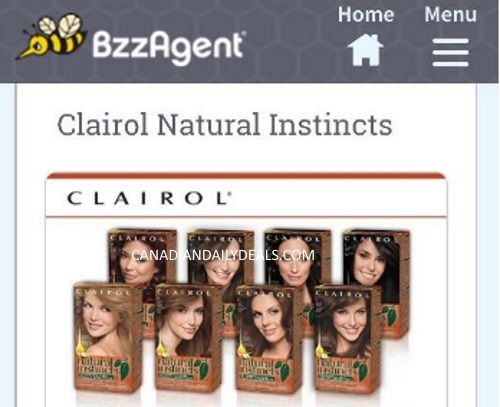 Here is another one that some readers are being chosen for, Clairol Natural Instincts hair dye, not to be confused with the Clairol Age Defy campaign that I blogged yesterday! Those chosen will be sent a Free box of Clairol Natural Instincts hair colour (choose between Nutmeg Dark Brown , Hazelnut Medium Brown, Suede Light Brown, Midnight Black, Clove Medium Cool Brown, Toasted Almond Light Golden Brown, Cinnaberry Medium Auburn and Linen Cool Blonde, while supplies last). You will also receive a digital coupon code to share with friends. Please note, being chosen for campaigns depends on a lot of factors, including demographics, and how you answer the survey questions. Click here to login/join Bzzagent.